It’s of course true that LED headlights on luxury cars and other new cars definitely look better than traditional halogen headlights, but the benefits reach far beyond looks — they’re also much safer than halogen headlights. They illuminate the road ahead of your car so much better, giving you visibility that will never be matched by traditional halogen headlights. What you might not realize is that you don’t need to buy a luxury car to get LED headlights. 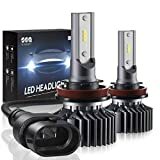 The Sealight LED Headlight Bulbs Conversion Kit comes in several different sizes to fit any and every car on the road, and it’s only $39.99 on Amazon.